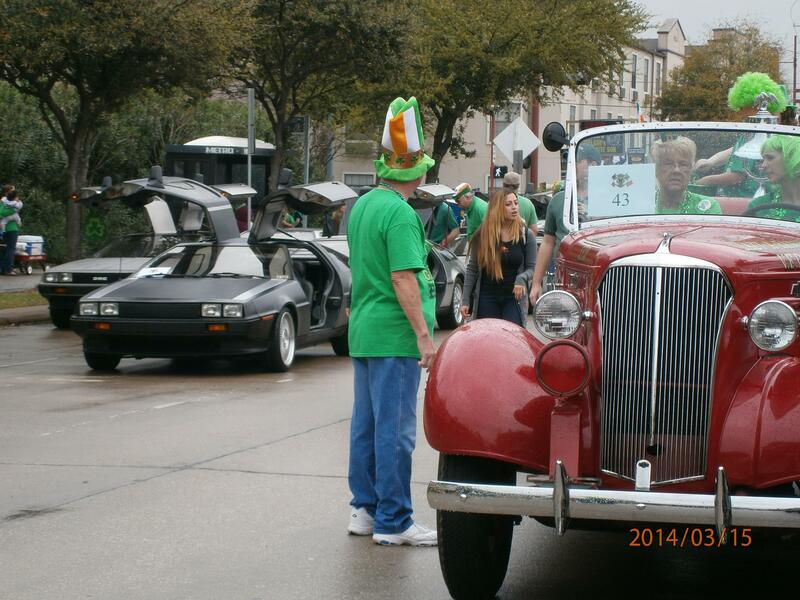 On Saturday, March 15, the 55th annual Houston St. Patrick's Parade was held. 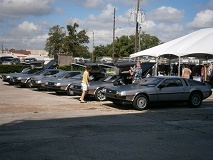 Eight of the Houston DeLorean Club cars participated, with support graciously provided by DMC (Texas), thank you very much. 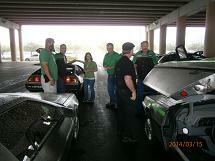 Member's cars present were (L-R, F-B) Ballard, Lunn (Mr. Pete), Mims, Key, Arnold, Terrell, Kidd, Dartt. Although the parade officially begins at 12 noon, participants are requested to arrive no later that 10:30 AM. As in yeas past, we meet under the clock-tower (SE corner of the Houston downtown ball park, at the intersection of Texas Avenue and Milo Hamilton Way (). The park is currently named "Minute-Maid Park" (formerly "Enron Field"). All photos by Thomas Kidd (click images to enlarge). Pre-parade line up. 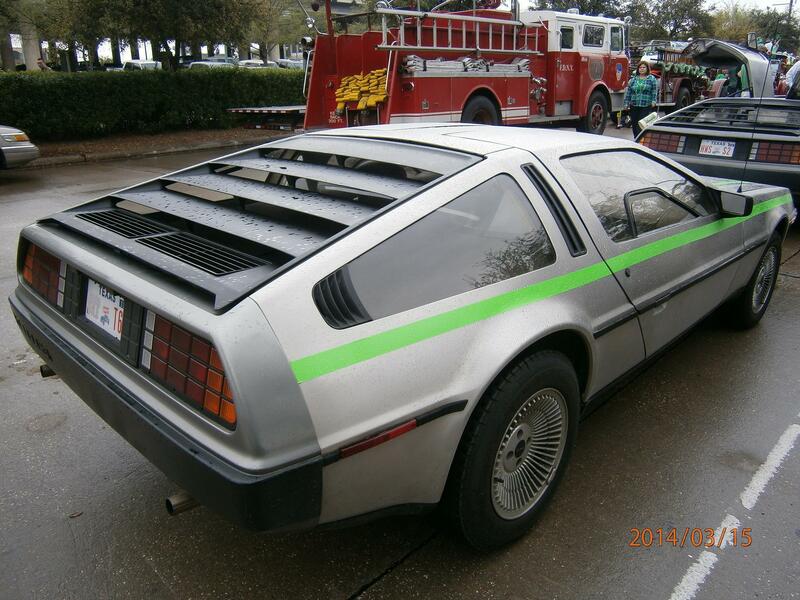 Somehow green stripes on stainless steel panels just doesn't look right. I can say that too, it's my car! "What the heck's going on over there??? 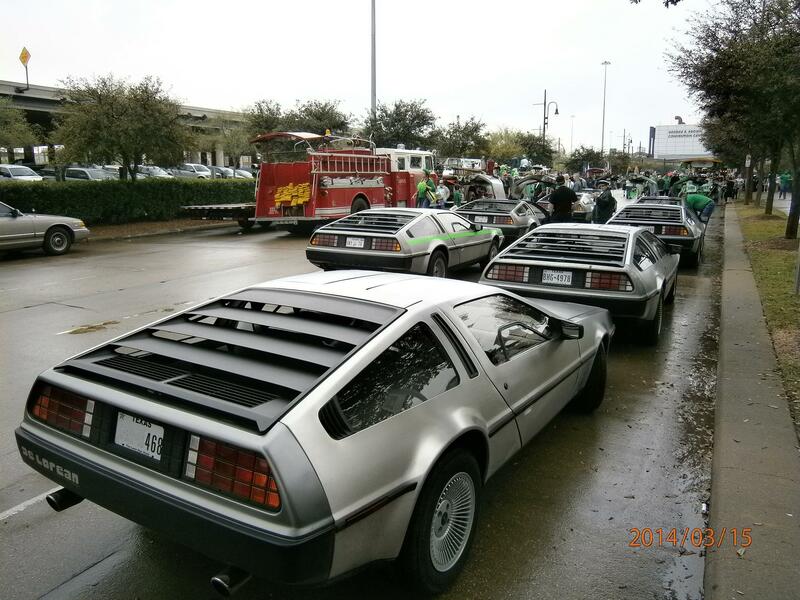 Vintage fire trucks (from The Fire Museum of Houston), people, and DeLorean's galore. What more fun could you ask for? 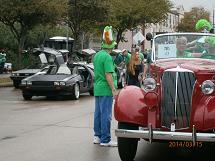 The weather started out somewhat overcast the morning of the parade, but really not too bad. Participants would not be deterred. During the parade, rain was sporadic. I guess you could say....wait for it...."It rained on our parade!". Ha! I knew that would get you! After the parade, we gathered under the US-59 freeway for some post-parade complaining, uh...I mean camaraderie. 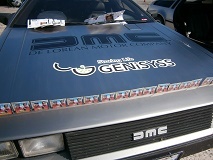 Every even year, the DeLorean Car Show and Convention is held. 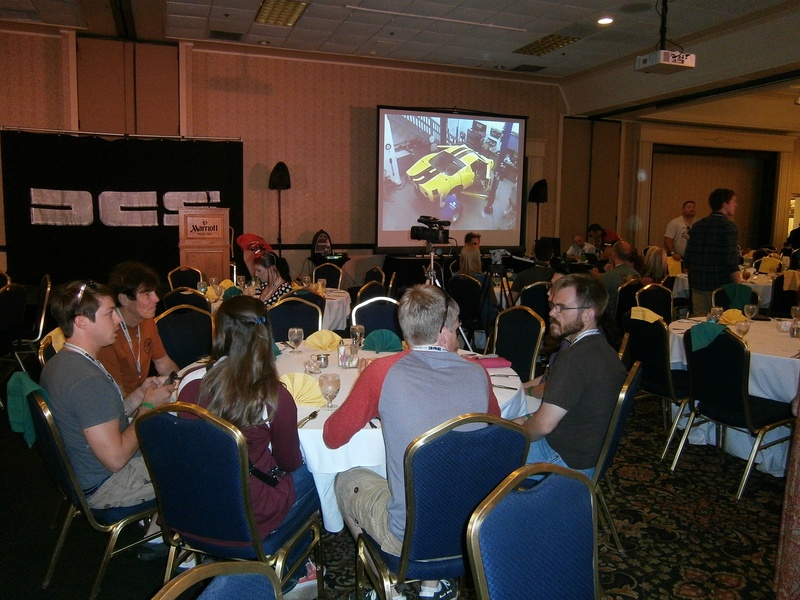 For 2014, it was held in Dayton, Ohio. All photos by Thomas Kidd (click images to enlarge). Thurday evening there are greeting sessions and technical information presented. 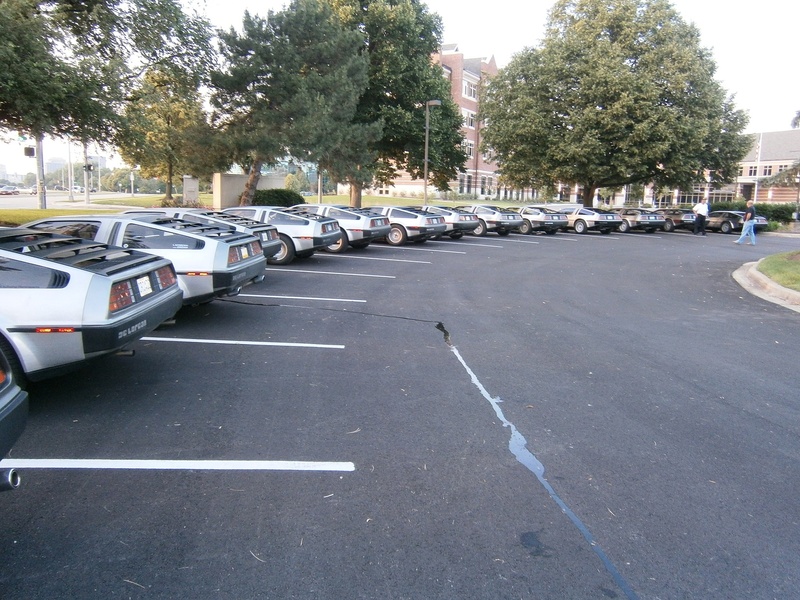 This is only part of the parking lot, filled with DeLoreans. By K. Koncelik's count, over 150 DeLoreans were present for this year's event. 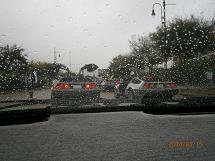 I have never seen so many DeLoreans in one place. The good will of Rich W. brought D-Rex and the DeLorean Limosusine to the show. 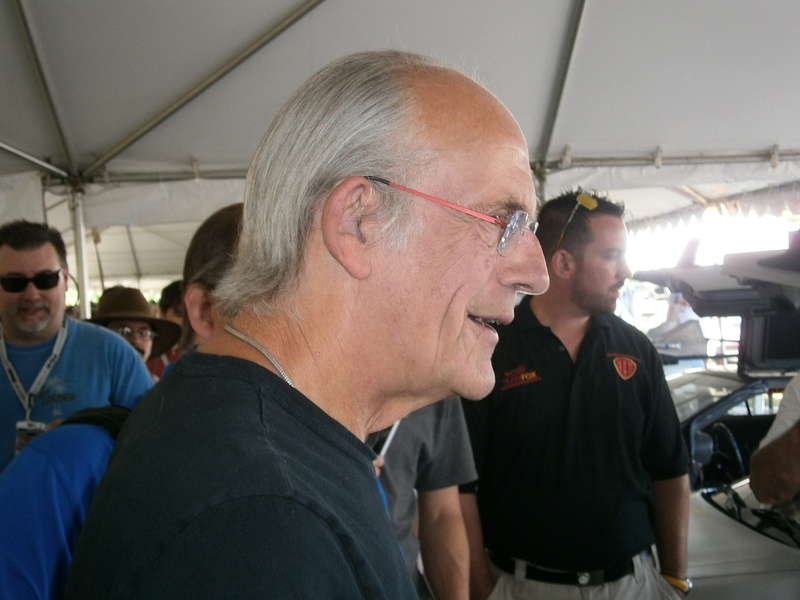 Actor Christopher Lloyd attended this years convention. A number of other BTTF cast also appeared, including Claudia Wells and Jeffrey Weissman. Mr. Bob Gale, producer/writer was also in attendance. Mr. Lloyd was extremely kind to everyone he met, no matter how big the gathering crowd was, or how hot it got. I personnally witnessed him signing many, many autographs. 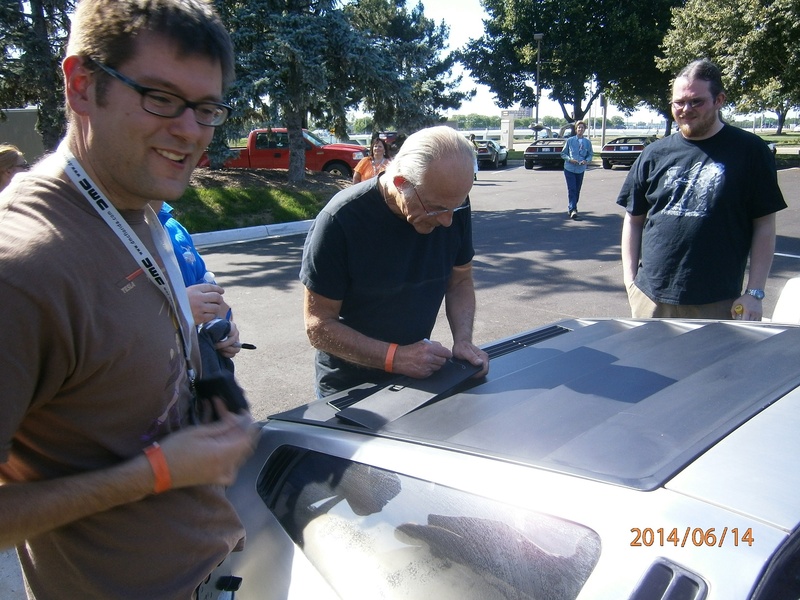 He also signed car hoods, dash boards and visors. Probably one of the most gracious actors you'll meet. 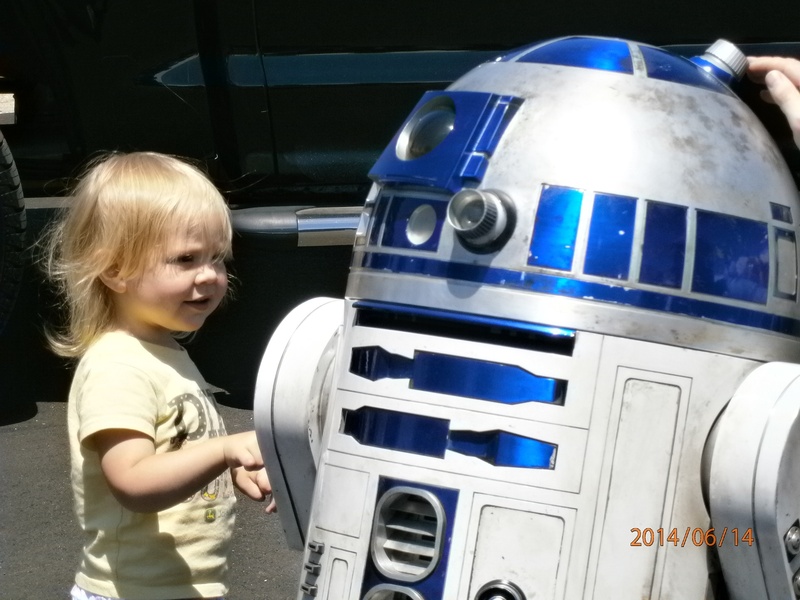 Even R2-D2 made an appearance, and made this little girl's day. For the second time, the Texas DeLorean Club was invited to be guests of the 1940 Air Terminal Museum at Hobby Airport for their monthly Wings & Wheels event. 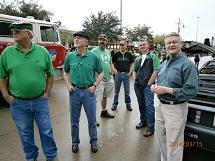 We had been their special guests in September of 2010, and a fun day was had by all. This time however, we did not get drive out on the ramp. There was a Mooney fly-in (to the museum) going that day as well. Again, we applaud the efforts of the museum staff in keeping up with the history of Houston aviation, and we thank them for their hospitality. All photos by Thomas Kidd (click images to enlarge). 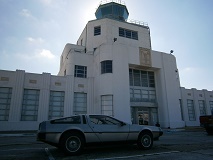 The first, lone DeLorean shows up at the museum, in the shadow of the eclipse of the sun by the old tower cab. 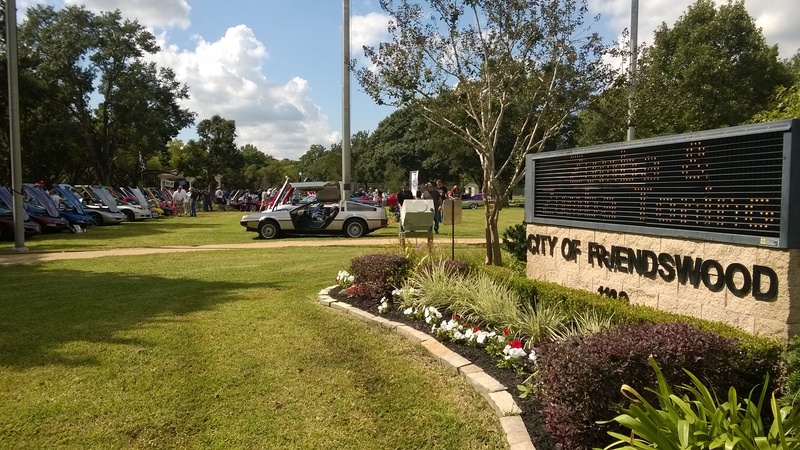 We were honored to have join us, Ron Ferguson and the Team DeLorean's car participating in this year's Fireball Run, benefitting the Race to Recover Americas Missing Children. 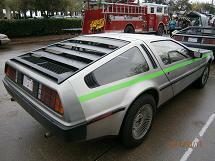 Here is a link to Team DeLorean's Facebook page. 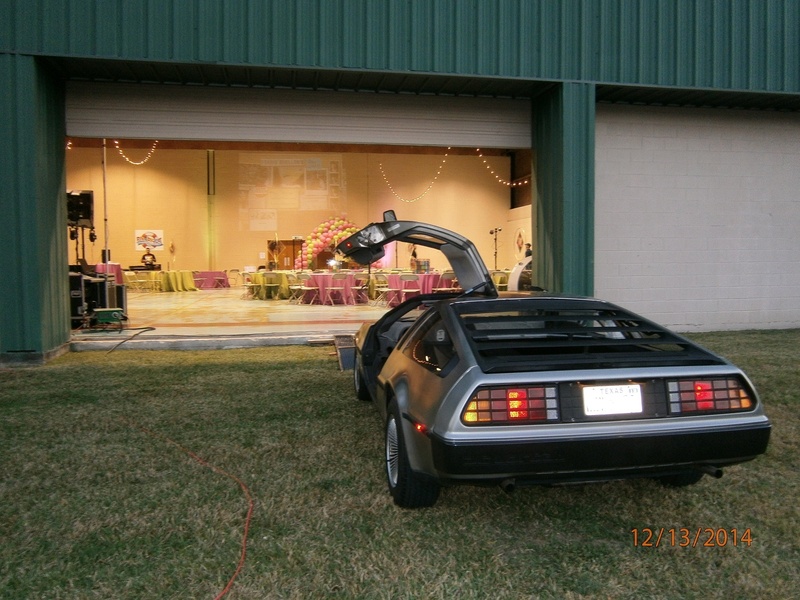 It turns out, the museum also invited the local Avanti club. 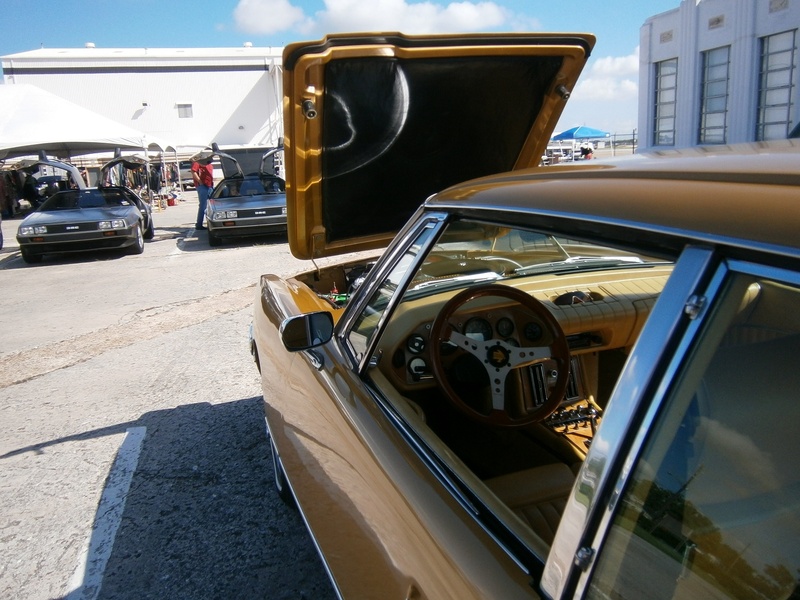 Three beautiful Avanti's showed up, and faced off the DeLoreans for attention. 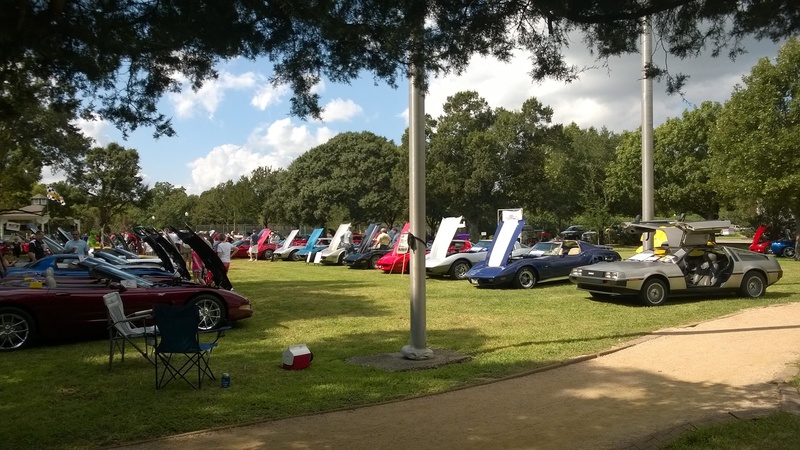 On occasion, the City of Friendswood holds a car show on the grounds of its Stevenson Park. 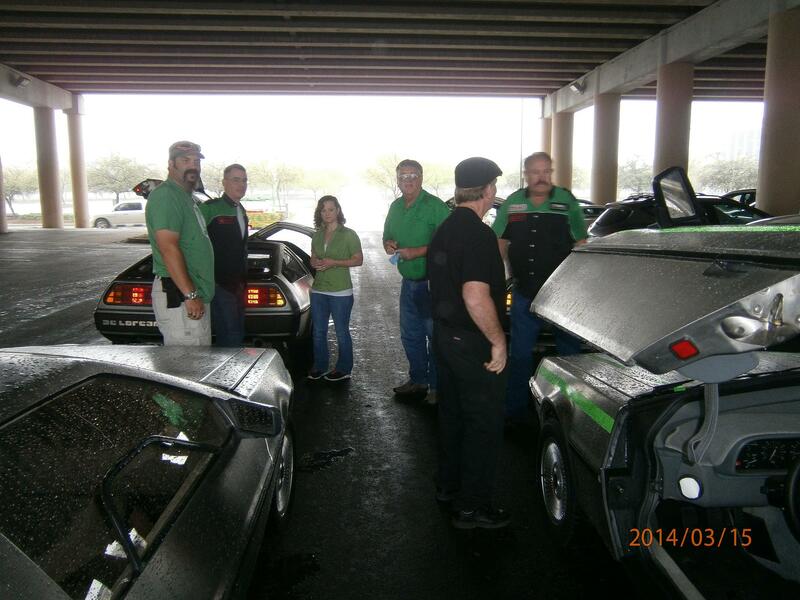 This year it was the "Good Grub and Gears Car Show", and benefited St. Jude Children's Research Hospital. 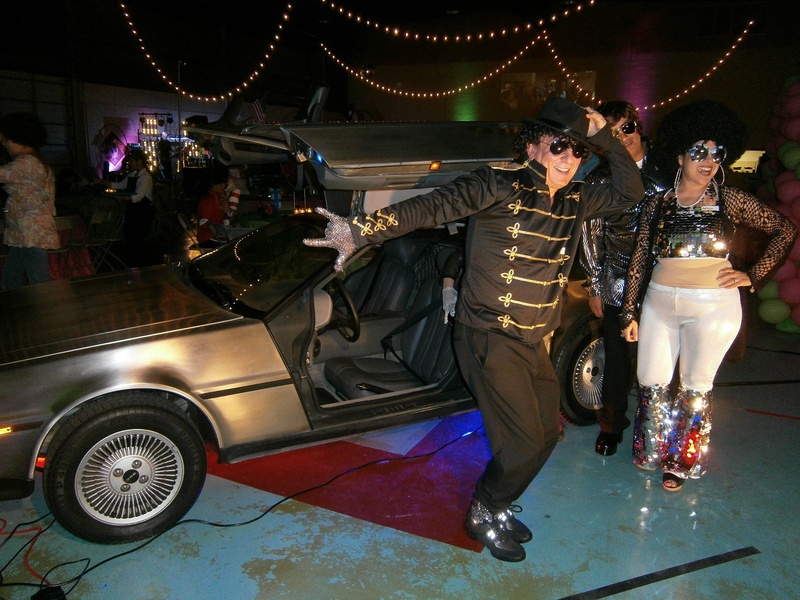 The show was also the Space City Corvette Club's Fall Car Show. This event was not advertised to the local DeLorean community, and so there was only one DeLorean in the show, who�s owner was invited to attend by a member of the Houston C3 (Corvette) Club (not affiliated with Space City Corvette Club). All photos by Thomas Kidd (click images to enlarge). 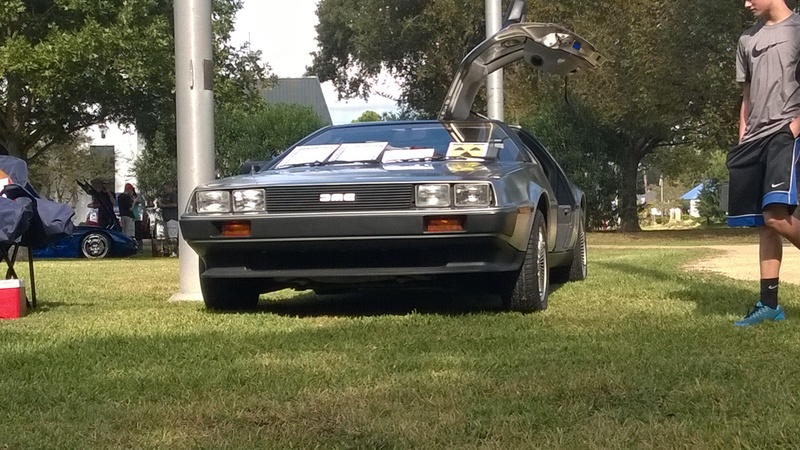 There were some 60 Corvettes in attendance, and only one DeLorean. 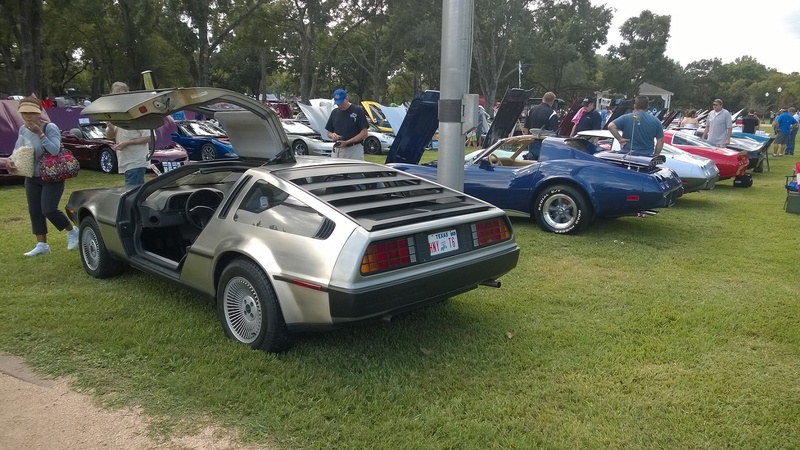 Here, a lone DeLorean made a stand in a sea of gorgeous Corvettes. Guess which single car got the most attention? VIN 3341 presented well amoung the tri-flag poles at Stevenson Park, in Friendswood Texas. It was an incredibly nice day, weather wise. 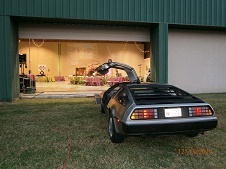 Thank you to the City of Friendswood for hosting the event, and good luck to St Jude Children's Research Hospital. 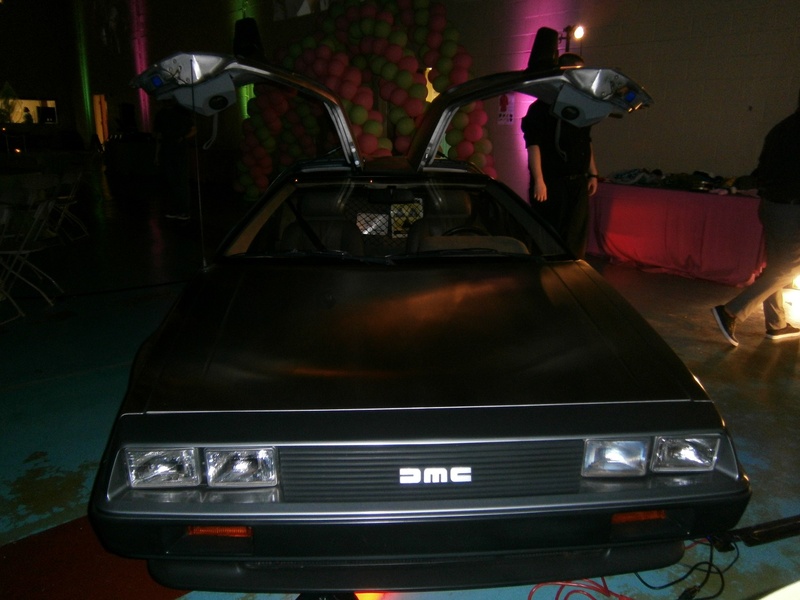 We were approached by a representative of the RiverKids organization to provide a DeLorean as a backdrop for pictures, at their 80's themed Christmas costume party. We did so and became one of their guests. The Austin Texas band SWAGGER played the night away, and in between sets there was a DJ who led a dance contest. Projected on the walls all during the party, 80's themed movies showed. Ferris Bueller's Day Off, Christmas Vacation were just a few. And in the middle of it all, we all had a catered full dinner. Thank you to the RiverKids for letting me, Thomas, spend the evening with your fun group. All photos by Thomas Kidd (click images to enlarge). 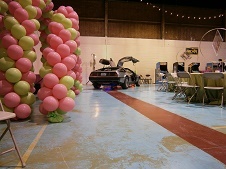 Well before the party started, Thomas Kidd's DeLorean shows up at the venue (a gymnasium), so to prepare the photo area. 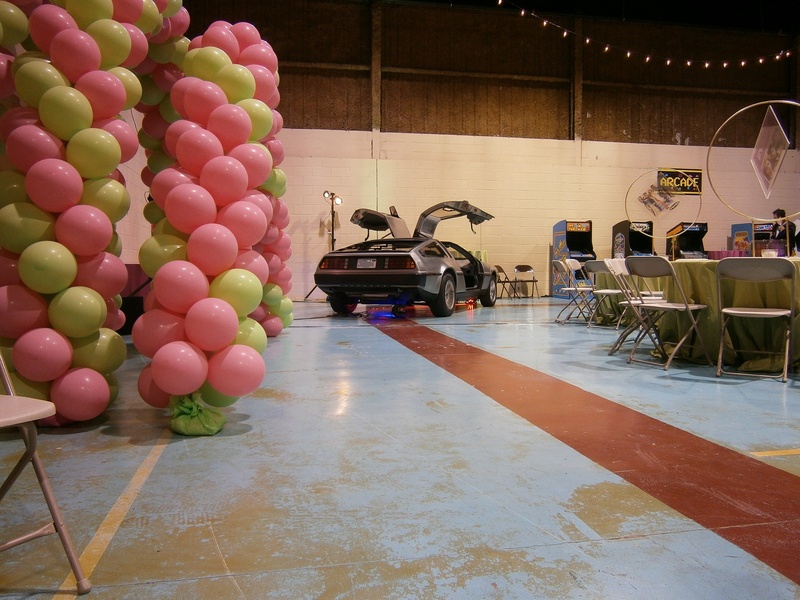 As this was an 80's themed party, RiverKids provided 6 arcade games from that period. Yes, your favorite was there! 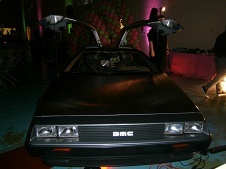 The DeLorean showed very well, although this picture really doesn't show how the shiny stainless glistened under party lights, and above red and blue accent lights. Michael Jackson decided to make a showing. 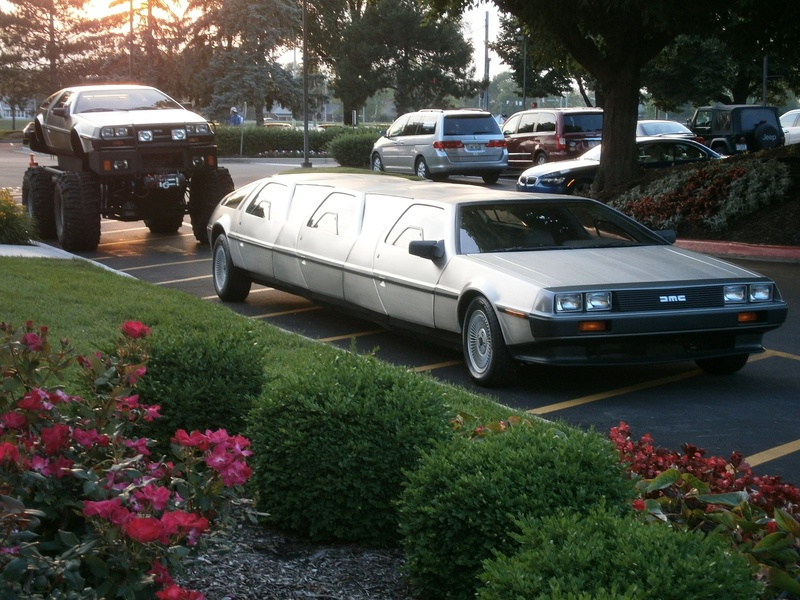 I guess he likes (liked) to be seen with DeLoreans too. 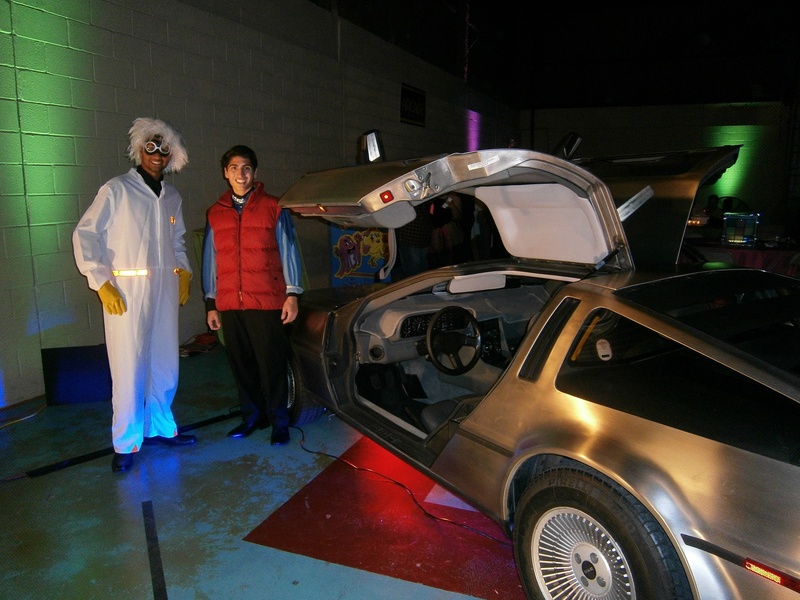 What 80's themed party that included a DeLorean would be complete without Doc Brown and Marty McFly showing up? This page has been viewed 4189 times.